In a letter to the Deputy Secretary of State on March 27th, 2018, the three Serbian Orthodox hierarchs in the United States called upon American officials to condemn the brutal police assault on Marko Djuric, the Director of the Serbian Government Office for Kosovo & Metohija, which also targeted journalists and unarmed citizens. Over 34 people were seriously injured during the attack on March 26th, with many requiring hospitalization. Noting that the brutality “seems to be an integral part of an orchestrated campaign against Kosovo’s Serbian population coming in the wake of the assassination of Oliver Ivanovic,” the hierarchs stated that the Kosovo Albanian authorities have once again demonstrated their lack of willingness to assure the most basic human rights and civil liberties for Serbians who were living in their own land. The bishops also called on the State Department to make clear that “the United States will never condone beatings of peaceful citizens, journalists, and public officials” in Kosovo & Metohija. 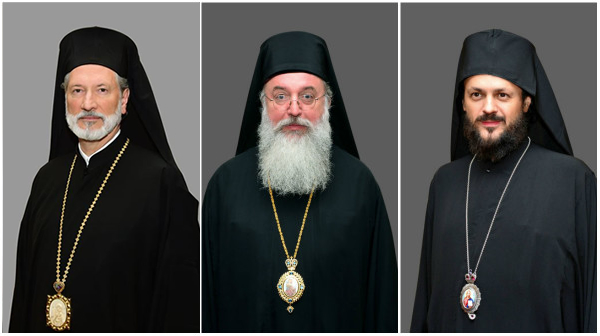 His Grace Bishop Longin of New Gracanica & Midwestern America, His Grace Bishop Maxim of Western America, and His Grace Bishop Irinej of Eastern America.